Your espresso should not cause you to break the bank, and that is why we have put together this list to help you determine the best espresso machine for you to purchase. 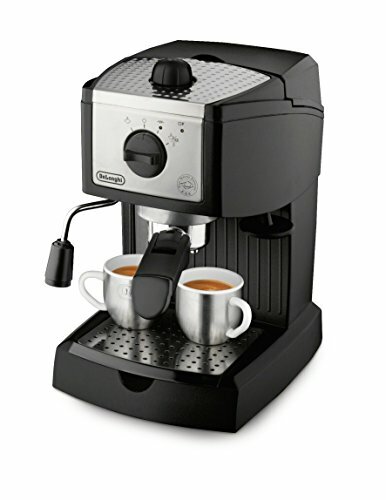 The reality is you do not need to break the bank to get an espresso machine that will do the job of making great espresso shots. All you need is something that is reliable and easy to use. Once you begin making espressos then you can upgrade your skills to creating delicious macchiatos, lattes, and other types of drinks. The best part – not having to break the bank to do it! Usually, if you love espresso you know that it’s time to invest in an espresso machine. Check out the table below for our top picks. When it comes to espresso machines you could spend nearly $1,000 for a super impressive machine or you could spend less than $50. The reality is when you are on a budget it is a bit foolish to spend gobs of money on an espresso machine. In fact, unless you are someone with supreme barista skills, having those very expensive machines often leads to levels of frustration because you do not feel like you are getting great value for your money. On the other hand, having a budget espresso machine allows you to enjoy espresso without the pretense and expectation built into those more expensive machines. The best part – all of these budget machines provide you with the same flexibility to create the espressos you would like without having to spend too much time having to learn the vagaries of how to brew espresso. 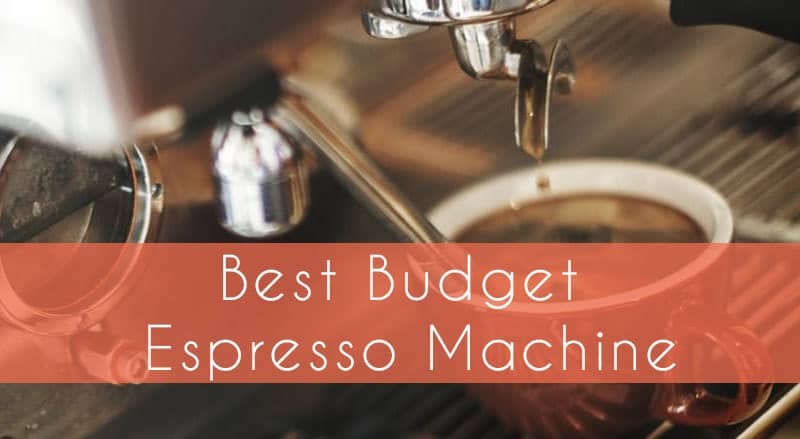 So, when you are looking for a simple espresso machine that delivers a fantastic drink without all the bells and whistles built into a machine, this list of the top 5 best budget espresso machines is the perfect way to have an elegantly brewed coffee while saving serious cash. Mr. Coffee is a brand that is well known for providing exceptional quality at a price that is best described as budget. 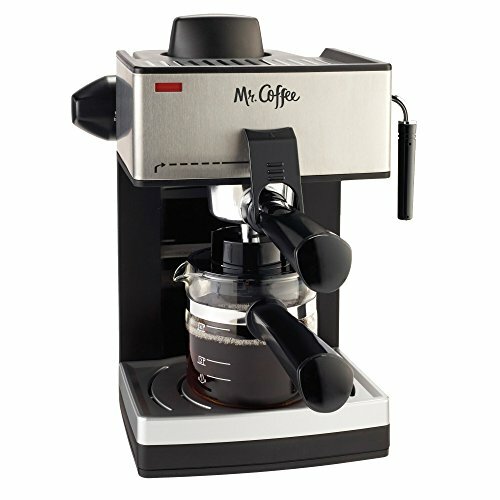 The reality is between the quality of the Mr. Coffee product relative to the price, nearly any Mr. Coffee machine is a great value, and when it comes to their budget espresso machine, there is no difference between the reputation and the actual truth of this particular espresso machine. The trick for Mr. Coffee is they keep things simple – as always. This has not changed with their espresso machine – if anything, what it has done is enhanced the reputation of the brand. The operation of this particular espresso machine is extremely straight forward, and there is no reason that people at all levels of espresso experience will not have an easy time creating fantastic espresso shots. If anything, Mr. Coffee makes it seem easier than it actually is. The machine has many detachable parts making for incredibly easy cleaning – just pop them into the dishwasher and they are easily cleaned. The glass carafe also is incredibly useful for your espresso. With the no-heat handle and the no-drip spout, this guarantees that your espresso remains hot and gets where it needs to be. The milk frother is also quite powerful and allows you to get the right amount of foamed milk for any and all of your drinks with ease. There are some drawbacks to this particular model, however. The first is that there are some leaking issues with this particular variant of the Mr. Coffee machine. The best explanation is because the water is heated so hot that it eventually causes the other parts to degrade without continual maintenance, but how accurate that is can be questioned. The next issue is on some of the machines the plastic has not been sealed properly and that leads to an odor in your drinks. Mr. Coffee however has good customer service and they are dedicated to helping you get a machine that works for you. 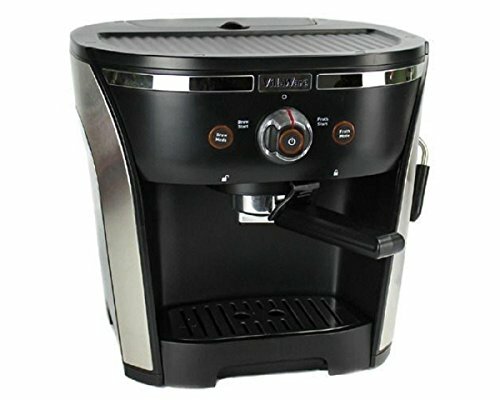 Overall, this is the top budget espresso machine, so enjoy your Mr. Coffee and know you will have it for a long time. Perhaps when you look for things to work well the simplicity of design is the most critical element, or maybe having something that just works in a straightforward manner is what is most critical. Either way, when you look at the VillaWare, right away you realize this machine is a different version of a budget espresso machine – its design fits in any kitchen and its function is perfect for the barista on a budget. Perhaps the first thing that jumps out at you is the large dial. VillaWare sought to make things easy, and this dial allows you to do everything you need to do to get espresso. It is a one stop in all senses, and once you decide to turn that knob, the system heats the water extremely quickly for you and waiting for your espresso is something that does not take too long. Also, the VillaWare is replete with removable parts including the water tank and the drip pan. Cleaning this device is incredibly easy, and it allows you to focus on the important things – such as how many of your guests need a great espresso! There are some areas in which the VillaWare comes up short though. The first is there are issues with the water reservoir. Specifically, the hose at the bottom is prone to leaking. The other major issue is that this particular model is not all that reliable. Perhaps it is because the VillaWare is fairly new, so it has some growing pains, but for a budget espresso maker, it acquits itself well enough. The VillaWare has charm and style that will match your espressos, and is well worth the investment. So, here’s the thing, not every espresso maker is something that you plug into the wall. And this is a wonderful thing because if the power goes out, so does your espresso. However, if you have a manual coffee grinder along with the Bialetti, all you need is a heat source and you are on your way to great espresso without having to deal with the vagaries of electricity. Now, here’s the best part – using the Bialetti is unbelievably easy! All you need to do is fill the pot with water, fill the filter with grounds and screw it on tight, then heat it up for about two to three minutes Once you see a couple spurts of espresso and steam coming out you are ready to go with your espresso. Sounds easy, right? Guess what – it is! This is perfect for camping or any outdoor type of activity. If you love espresso and enjoy the outdoors, what could be a better combination than the Bialetti and a great hike? Now, there are some downsides of the Bialetti. The first is this is a complex item to clean, you need to be sure to watch out for the washer and various other parts. Ultimately, if this is not cleaned properly than your Bialetti won’t perform as well. The second is kind of obvious. The reason there is simply that you can’t necessarily control the heat the way you can with an electronic machine. So, therefore, it is entirely possibly to overheat or underheat the water and not get the right tasting espresso. 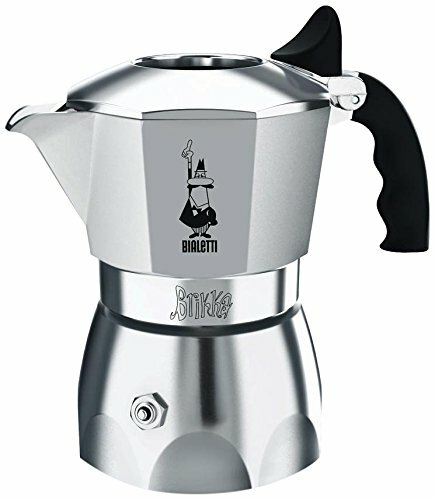 The Bialetti is a great espresso maker for those seeking a different way to make a great drink, but it has its flaws and if you are alright with those, then it’s the right espresso maker for you. When you have a device that does one thing and does it well, that is an amazing thing. In today’s world where everything seems to have multiple purposes, the device that just does what it advertises is unique and a welcome respite from this overzealousness for multi-tasking. The Excelvan is small, and it has just one job – make great espresso. The design of it is probably the biggest asset. The Excelvan is small and portable – you can fit it anywhere in the kitchen and it has its rightful place with ease. The next great thing about the Excelvan is the large four cup carafe. It has a great handle allowing you to easily handle the carafe without burning yourself, and also has a simple to use milk frother. Frankly, the straight forward design of this particular espresso machine makes it nearly perfect. But, the key word to that last sentence is “nearly.” There are some problems with the Excelvan that must be explored before going forward to sing its praises. The first problem is it has a high wattage and has been known to catch fire. Of course, there is no need to tell you why this is bad, and if there is a need, then you probably have bigger concerns than espresso. The other issue it has is the steam is not consistent and causes problems brewing the espresso. The Excelvan is a great espresso machine if it will be your first, otherwise if you have some experience it can be a bit frustrating. If you are looking for something that allows you versatility, the De’Longhi does a great job allowing you to have the most convenient options at your disposal – namely you can either have espresso pods such as Nespresso or you can use ground coffee. This alone makes it a tremendous value as you can have multiple uses for your espresso machine. Now you may think that with multiple ways to brew espresso, that this machine would be complicated. You are very, very wrong. In fact, the De’Longhi makes it very easy to brew the best shot of espresso consistently and with little work on your part. Frankly, pulling espresso shots couldn’t be easier. However, for some the best part of this particular espresso machine is the removable water tank. Instead of having to worry about getting in the tank and cleaning it out, because this water tank is removable all you need to do is throw it in the dishwasher and life is easy. That’s the key with the De’Longhi, making things easy with common sense solutions to normal espresso problems. There are some problems with the De’Longhi, however. The first of these problems is this unit does not have a good track record when it comes to durability. Perhaps it is the different parts or maybe it is just as simple as this is a budget item and is budget built. The other problem the De’Longhi has is some leaking issues. Going back to the original problem with how durable it is, the problem becomes that many of the parts are thin plastic, so when heat goes through the plastic, it gets weak. Finally, if you are seeking for an entry into espresso making, then you can do far worse than the De’Longhi, it’s a good machine for the price. The big difference between espresso and drip coffee comes from how the water is filtered through the grounds. The most important thing is having the finest possible grind for your espresso. When this happens, you can have an easier time forcing the water through and getting the most concentrated cup of espresso. However, there’s more to it than just forcing the water through, there needs to be the right temperature and pressure. This will lead to a fuller, more concentrated espresso along with having the right level of crema topping it. Having the right espresso machine means you get this process consistently repeating itself and thus, getting a great cup of espresso. A budget espresso machine does not mean that you are someone who skimps on quality. In fact, many of these budget machines perform their functions admirably and allow you to do a great job of brewing espresso. Don’t waste your time and money saving up for a big time espresso machine – instead give yourself the gift of great espresso without breaking the bank thanks to these machines that we have reviewed for you!